Have you been trying to find the right CBD oil for your needs? Whether you’re new to CBD or you’re looking around for a superior product, this guide was made for you. As CBD products continue to flood the market, more consumers are catching on to the tremendous amount of benefits cannabidiol has to offer. Not every CBD brand offers the same level of quality with their ingredients, though. Until the industry gets regulated more efficiently, there are plenty of CBD busts to watch out for. I’m going to provide you with a detailed guide on CBDfx, a brand I reviewed recently to test out whether they were a high-quality brand, or another bust. CBDfx drew my attention because of the variety of products they have. Not just limited to CBD oil, they have CBD dabs, vape additives, infused drinks, edibles, and more. While I’m only diving into their CBD oil tinctures for the purpose of this review, I’m eager to go back and try other products! They wanted to provide the widest selection of organically grown, high-quality CBD products, which means there’s a CBD item that’s perfect for everyone through their store. Their edibles, gummies, capsules, drinks, and other consumables make it easy to forget you’re even taking CBD until you feel the relief and effects take hold. The brand itself is after offering the highest-quality, full-spectrum CBD in the industry. While that’s no small task, their giant of a goal made me a little more confident in their products. The fact that they keep their third-party lab results handy on their website helped, too. Also, CBDfx appears to offer both First Responder and Military discounts, which lets you verify your position immediately and receive the savings. This built up my confidence more in them as a brand that genuinely wants to help people see the benefit of CBD. 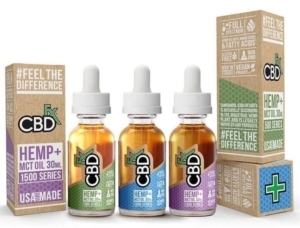 CBDfx offers three different strengths of their CBD tincture oil: 500MG, 1000MG, and 1500MG. Each bottle contains a super potent concentration of CBD, as many of the products I’ve reviewed in the past have been under 500MG. I tried out all three of their tinctures, starting with the lowest strength bottle. I have a higher tolerance to CBD than most, so I didn’t expect it to do much, but I was impressed with how much better I felt throughout the day after taking it. This CBD tincture can be added to food or beverages, but I prefer the old fashioned and more effective way of taking it sublingually. I put half a dropper under my tongue for 60 to 90 seconds before swallowing it. This helped the CBD hit my bloodstream faster so I could get the most out of its medicinal properties. Overall, the 500MG bottle would be decently rated for a mid-tier CBD user. Someone with a much higher tolerance would probably want a higher strength bottle still, but this is perfect for beginners and people with mildly raised tolerances. As for the 1000MG bottle, I certainly felt its effects faster. This would probably be the ideal strength for anyone, whether you have a high or low tolerance. If you want to start incorporating a CBD tincture into your daily routine, this would be the best one to try it with before upping your dosage. Finally, the 1500MG container was my favorite out of the three. Incredibly potent, I felt the effects faster and longer. I noticed common pain areas were numbed across my body, I was more energized and feeling productive, and honestly on top of the world. At the same time, taking it about 30 minutes before bed gave me the best sleep I’d had in weeks. It helped me fall into a deeper sleep faster instead of swimming in my own thoughts. I didn’t wake up throughout the night, either, which is probably what sealed the deal for me with this product. Even though the bottles must legally be sealed with child-resistant caps, they are especially difficult to open! My overall experience with CBDPure was purely positive, and I’ll be coming back for more of their CBD products to try out. Though I only tried the tinctures today, I found my favorite with the 1500MG strength container. CBDPure is a high-quality, reputable brand that I trust more now that I’ve tried their tinctures. They provided speedy shipping, they were prompt with communication, and delivered a product that really impressed me. Have you tried CBDPure yet? Which products sound the most interesting for you to try?